Baby Aria and I spent the day in our garden. She helped me trim the basil plants and gather ripe peaches in large baskets. Since the skin of this specific variety of peach is very fuzzy, they couldn't be eaten as is because it could have irritated her throat. So I blanched the fruit and peeled the skin. The skin unveiled a beautiful yellow flesh and the stone was easy to remove because the fruit was so ripe. They were very flavorful and sweet. 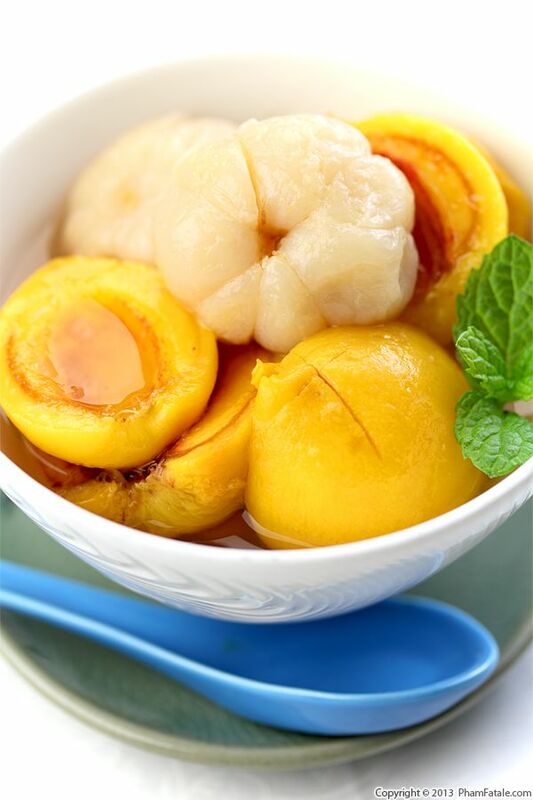 I made syrup flavored with kaffir lime and ginger and poached the halved peaches for a few minutes. 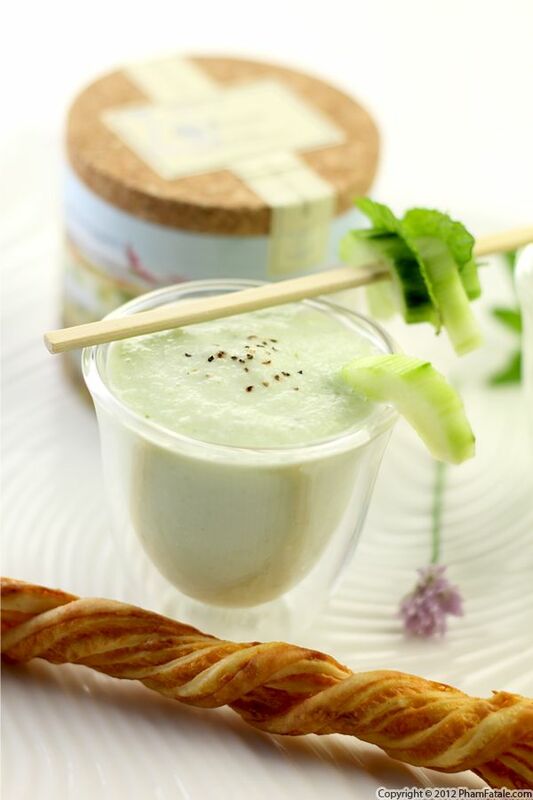 You could garnish the chilled peach soup with other small-sized fruits such as berries. I wanted to impart an Asian flair to the light snack, so I paired it with purple mangosteens. The result was spectacular. 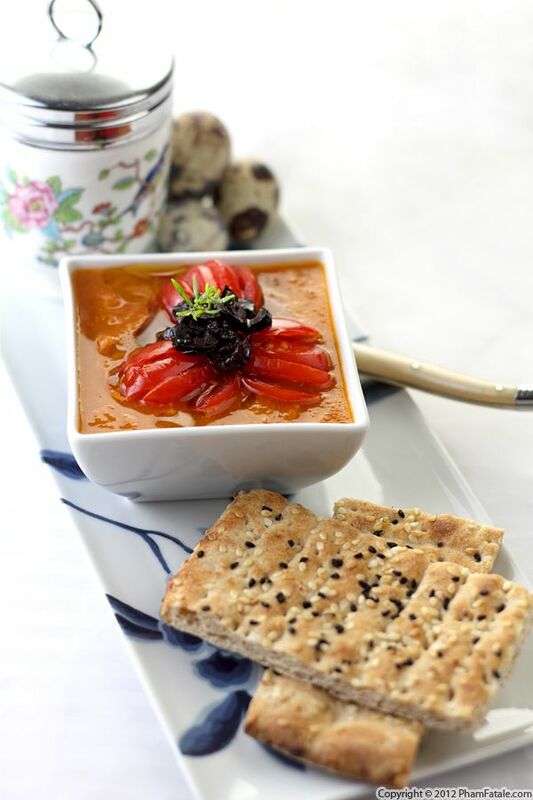 Gazpacho is a refreshing first course I just had to make before the summer ended. The preparation is very easy. Cucumber, roasted red bell peppers, onions and fresh tomatoes are blended together. I flavored the cold soup with garlic, lemon, tarragon, a bit of agave nectar and extra-virgin olive oil. To provide a touch of saltiness, I topped the soup with oil-cured olives. I served it chilled with "oeuf à la coque"-style quail eggs ("soft-boiled eggs" in English). Accompany it with lightly toasted noor thin bread from the folks at California Lavash and you'll have a truly fun summer dish! Want some lavash to try out the recipe yourself? Don't forget to enter our contest in the box below! We’ve been experiencing unseasonably cool weather this week. I’ve been making a lot of healthy summer salads for the family, but today I decided to switch it up a bit and prepare a big pot of hot soup. 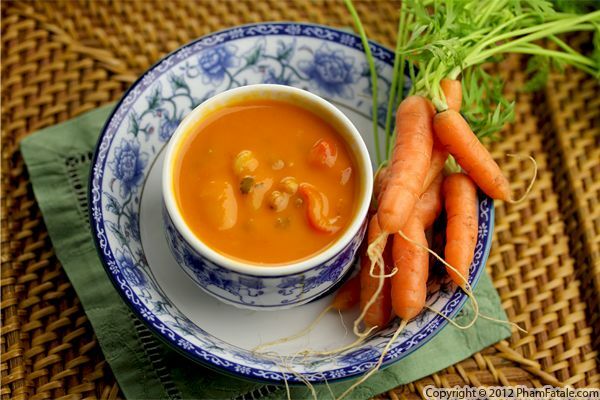 I used the remaining freshly picked carrots from our garden and roasted red bell peppers as the main flavorings in the soup. To ensure that it remained healthy and well-balanced, I added well-known French beans called flageolet beans. They resemble large, pale green kidney beans and have a very delicate flavor with a starchy texture, which married perfectly with the velvety soup. My husband Lulu gathered so many Marketmore cucumbers from our vegetable box over the weekend that our family's had to work hard to keep up. I made the family's favorite cucumber sandwiches and once we had our fill of those, I made a big bowl of cold cucumber soup. I realized that cucumbers can taste pretty mild, so I added smoked blue cheese and plenty of fresh herbs to ampup the flavor. Planting your own vegetables can be so rewarding, plus I've noticed that homegrown cucumbers are so much more fragrant than the one from the market. I could actually smell the soup in the kitchen from my front door! I still have a few cucumbers left from this batch, so I'll probably make some raita (Indian yogurt sauce) for tomorrow. Do you have any suggestions? This weekend we had gorgeous weather. It was our first chance to enjoy the sun and eat outside, so I prepared a wonderful Sunday brunch for the family. 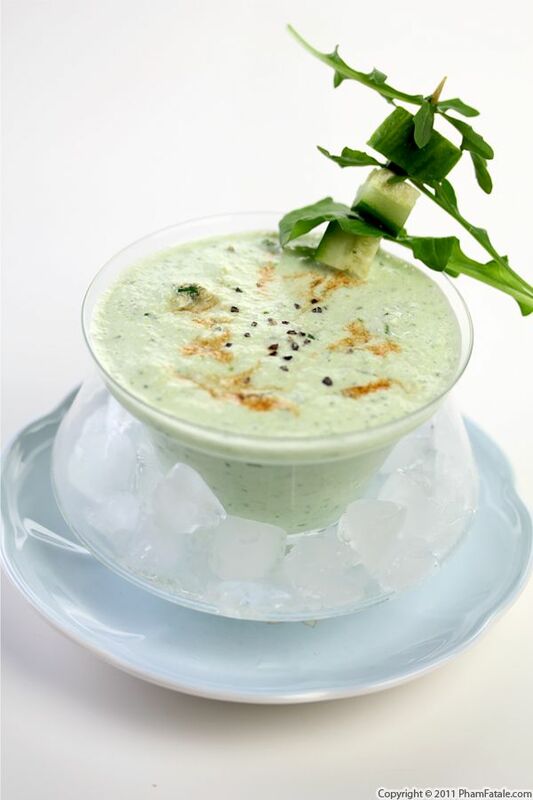 The centerpiece of the meal was a chilled soup flavored with arugula and cucumber. Arugula gives both an attractive color and a wonderful taste to the soup. If you’ve never had it, it tastes like a cross between mustard and hazelnut. I served the refreshing soup with little puff pastry appetizers. Easy, healthy and delicious.